Bay scallops have 18 pairs of eyes set in their mantle along the margin of the shell. Bay scallops have a short life span of 1 to 2 years or so. Unlike other mollusks that are tied to specific locations by burrowing or attachment, adult bay scallops are extremely motile. They swim for short distances by jetting water through their valves. 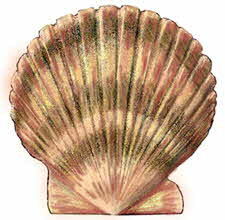 New York designated the Bay Scallop (Argopecten irradians) as its Official State Shell in 1988. The world catch of scallops is about 1 million tons. Saint James was the brother of John, and one of the 12 Apostles. The scallop shell was the symbol of the crusaders of the Order of Saint James. (Santiago in Spanish and St. Jacques in French). Supposedly his intervention saved the life of a drowning knight. The knight emerged from the sea covered with scallops shells. Scallops were named ‘Coquilles St. Jacques’ in St. James honor, as was the dish. Coquilles St. Jacques means 'shells of St. James'. (St. James de Campostella is supposedly buried in the Spanish city Santiago, in Galicia, but there is controversy as to whether he actually preached in Spain or not).